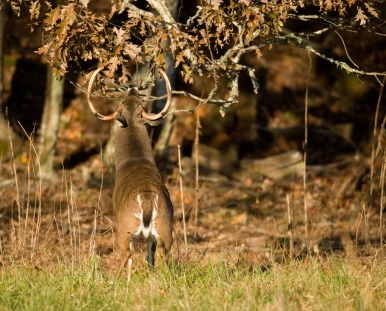 Curious about whitetail deer behavior during rut? I have interesting information on this intriguing animal and offer the best venison recipes; also featured on OutdoorChannel.com. If you were to look for a whitetail, the buck illustrated above would give you good idea on what to look for, but I am going to go into more detail. Known for that white tail that is lifted ("flagged") to warn the others to get a move on - these deer are very graceful and strong. They can easily clear fences almost at a standstill. Once you are familiar with whitetail deer behavior, your success rate to harvest a deer is almost guaranteed. But what fascinates me is the whitetail deer's behavior not only during rut, but really all year-round. They are a social animal and communicate by sight, sound and smell. It is also very important that they abide by a social hierarchy they establish themselves. I will explain this in a minute. As I am writing this (November 1), last night was a full moon and the bucks were seeking. The cold air at night seems to ignite them into a fury looking for the first "hot" doe. I see them now during the day. The doe at this point, wants nothing to do with them. The fight for breeding (pecking) order is well on it's way. This began late in the summer. The cold autumn air is like no other smell you can imagine. It reminds me of football and hunting. The trees have just dropped the last of the red and yellow leaves and every step you take can be heard for quite a ways in woods if you don't know how to walk quietly. Squirrels are in high gathering mode and chattering at one another and me. It's one of my favorite times of the year. Learn How To Make Your Own Ground Blind (Duck Blind and Goose Blind). 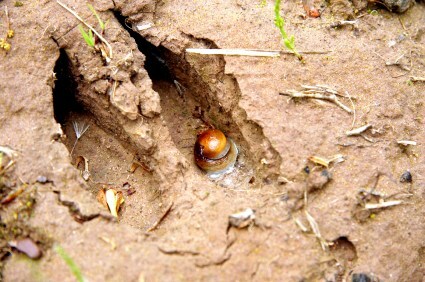 The first signs of activity are seen way before the whitetail deer even thinks about rut. I see a large scrape under a tree that has been started and every buck that walks by will check it out and leave their scent. The dominant buck in the area usually starts the scrapes in early fall and freshens them up before and during rut. To describe what a scrape looks like, see the picture below. 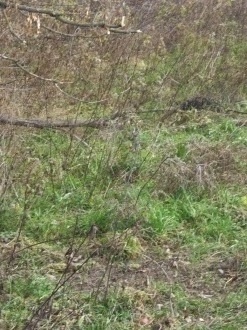 It is a mark where all of the grass and debris is gone and directly above it is a broken licking branch. Do you see it? This branch has to be within their reach because they leave their scent and saliva on it. They will stand on their hind legs to reach it also. The reason the branch is broken? One angry buck. He got a whiff of another buck in his territory and likely used his rack to snap the branches off. When you put out fresh dominant buck scent on another whitetail deer's scrape (who is dominant in that area), it tends to get him riled up. They will also tear the scrape up. The next buck arrives and does the same, and soon enough it becomes a very large scrape. The highest activity is usually within 2 weeks of breeding. 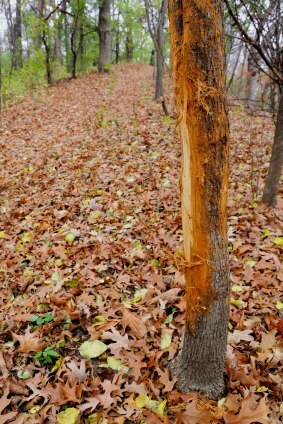 The dominant buck usually places the same scrape in the same place the following year. As deer pass, they will check out the scrape and may or may not urinate on it. 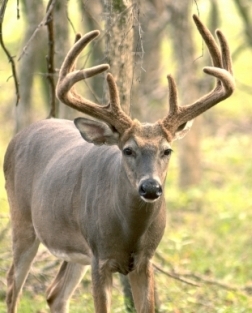 Then the buck will also rub the licking branch (photo below) above the scrape with their forehead and preorbital gland which releases a waxy substance with his own scent. Whitetail deer can leave their scent throughout the year from different areas on their body. In the corner of the inner eye you will find a tiny black slit. This is called the preorbital gland, and it secretes a waxy substance that serves as identification among each other when they rub branches, shrubs and trees. The tarsal gland is located on the inside of the hock of the whitetail deer on both legs. During rut the doe and bucks will squat down and urinate on these glands, rub them together and a dark brown or black color is formed. The smell is totally their "own scent" and these glands are used to identify which whitetail deer have visited the scrapes or rubs and to find each other during different stages of rut. 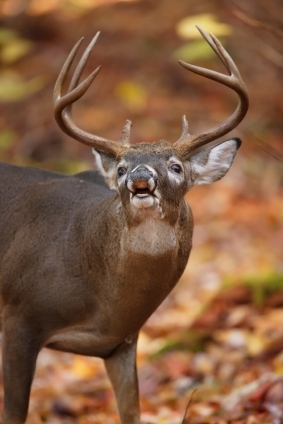 The forehead gland is located between the whitetail deer's eyes and the base of the rack. Again this is a identifiable scent of each deer; to leave their mark and to let the others know that he was there rubbing on trees, shrubs, etc. The metatarsal glands are located outside of the leg above the hoof and the interdigital gland is between the toes of the hooves - on the front legs. This gland of course, secretes a substance so they can be found by fawns or others. During rut, a doe's interdigital gland will signal to a buck that she is ready to be bred. This buck will track her like a blood hound until he finds her. As I mentioned earlier, the whitetail deer have a sure-fire way to alert the herd of danger. The first of course, is lifting that large white tail and "flagging" to others before they run. But before this happens, the hair will rise down their back as they try to determine what it is that they see. A doe (or buck for that matter) will stomp her foot to make the object move, and if nothing happens they may do it again and snort. This signals to surrounding whitetail deer that something is askew. They are on red alert now and if she cannot determine what it is, or if she is still nervous - she'll let out a snort and they are on the move. The picture on the left makes me smile because this is a nice buck rub. Don't get me wrong, they get a lot bigger than this. 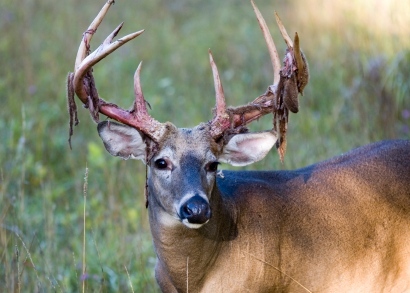 Whitetail deer rubs begin around the end of August - first, to remove the velvet on their rack. It may take a few hours to remove the velvet or a few days. 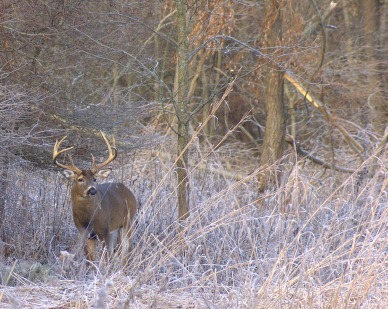 Usually the dominant buck in the area is the first to place the rub. Early fall arrives and rubs are are placed on bushes, saplings and trees to "mark" their area; scent is also left. 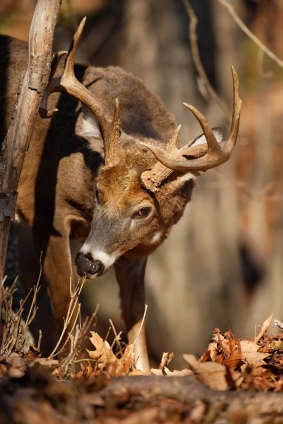 The whitetail buck continuously pushes and scrapes his antlers and forehead against the rub object. Half way through October that low visibility placed rub is now a high visibility rub. He is tearing the bark and "sparring" with the trunks of saplings and trees. 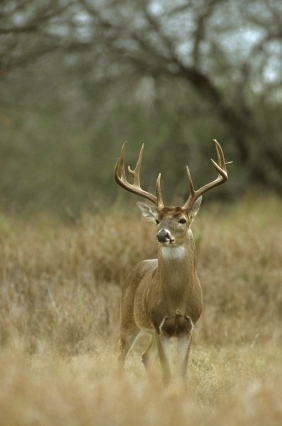 During rut, the whitetail buck's neck begins to swell due to the testosterone pumping through their blood. This and the continuous rubbing on saplings and trees, builds their necks up so much that it looks like the buck's head is just placed on the body - you can't see the neck because it's so swollen. During most of the year, physical and eye contact are avoided among the whitetail deer herd. But in the early spring and summer some sparring will break out to establish dominance. 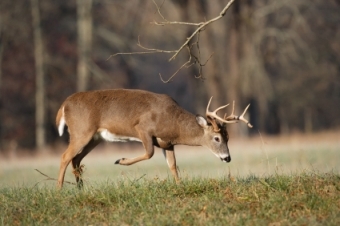 The conflict begins when a dominant buck (or thinks he's the dominant buck) is approached by another whitetail deer and pecking order has not been established between the two. The dominant posturing of a buck (or doe) includes erecting hair on the back of the body and approaching the other deer sideways at an angle to look bigger. They will walk stiff legged, ears back and are "ready to rumble" at this point. However, these are not the drag-out sparring that happens during rut, but certainly dominance is achieved. The does also are apt to have a disagreement every now and then. Usually it is the matriarch doe teaching their offspring a lesson, or fighting for pecking order to remain the dominant doe in the herd. She will stand on her back legs and "box" the other with her sharp hooves. A group of whitetail does that run together are what you would call a "close knit family." The other does are often sisters or aunts and are related in some way, and the offspring of the does are raised by her "relatives" if she is killed. The doe fawns will stick with the mother until they are 1-1/2 years old; or sometimes for life. The young buck fawns are literally "kicked-out" of the pack by the does at a much earlier age. The does will beat and box them with their sharp hooves continuously, and the young bucks run for fear that she will kill him. This is nature's way to prevent in-breeding, which would happen if she did not do this. It's always a sad sight to see - a young buck wandering alone after the beating he took from his mother. They do not stay alone for long, and soon hook up with others that have been kicked out of the herd. This group of male deer is known as a bachelor herd. When a deer sees something unusual or thinks they are in danger, they will stomp their front foot and let a snort out through their nostrils. This is called an alert snort, and this deer is communicating to the others that something is not right. All deer at all ages do this. A distress call is used by both sexes of the whitetail deer and at any age. They use this continuous uncontrollable scream when they are being attached or are critically injured. If you have ever heard a rabbit scream; it is very similar...and is very unpleasant to hear (to say the least). All members of the family group are alerted; bucks and does run to try to help. At this point they know they are in danger and still come to assist; a great feat for such a nervous animal. The next 4 whitetail deer sounds are mimicked in the wild by hunters, and many hunters do have excellent results with these calls when they know how to use them properly. The first is the bleat and is usually made by a doe and her fawn to find each other when separated. The fawn will bleat, and if the doe does not come right away, the bleat will become louder and louder. A fawn with a doe normally does not bleat; so this sound can also attract predators. To the hunter, the bleat will bring does to the area and that is what he/she needs to shoot a buck. Therefore, where there are does - THERE ARE BUCKS following close behind. The grunt is a sound made by a buck when it is trailing a doe in estrous/heat (a hot doe). This is one of the most popular of the imitated calls because it can attract a large dominant buck or a number of bucks. Let me explain. During rut, the only thing that the bucks are looking for are hot does; they do not sleep, and rarely eat or drink in two weeks time; many have died. Now, if he has the does in his group bred, he begins the search outside of his territory. I do want to mention that dominant does "grunt." She does this during dominant interactions with others and to call their fawns. If this wandering buck comes upon a doe that is ready to be bred - he grunts - trailing her - which alerts the dominant buck in "his" home area that a strange buck is in his neck of the woods...and trailing one of his hot does to breed her. The fight is on. The wandering buck is closing in on the doe in estrous and hears a snort/wheeze. A snort or snort/wheeze sound is done when they want to challenge another deer either hierarchically or territorially anytime of the year. It is done especially during rut prior to a serious fight. Turning around he faces the buck who's territory he has trespassed and was "grunting" his doe. This buck's hair is sticking up, and he is walking stiff-legged at an angle towards him, and snorts again. A buck will fight or flee at this moment. A single aggressive snort with no wheeze is a more serious threat to the wandering buck than with the combination snort/wheeze. The picture at the left is showing a whitetail buck curling his upper lip and it is called flehmen. There is a gland at the roof of their mouth called the Jacob's gland and is found in most hooved animals and in this case is used to detect a doe in heat. The buck will lick either the doe or the ground where she urinated or defecated and inhales for several seconds, curling his top lip. The Jacob's gland enables him to detect the doe's scent; that she is close or in estrous. He will also do this anytime during the year when he catches a odor that is new or interests him. He will grunt and bleat like a fawn when he is flehmening; especially if he has found a hot doe. If he makes a series of long grunts, she is almost ready to breed. If you are scouting for whitetail deer activity, I have two pictures for you to use as reference. 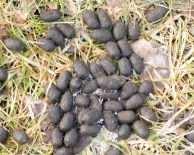 The photo on the left is whitetail deer droppings. If there is fresh snow, new deer tracks and droppings are easy to spot and a good indication that you have found their home turf.